Rhetoric is the art of effective speaking or writing, especially using figures of speech and other compositional techniques to inform, persuade, or motivate a particular audience in a specific situation. Skills for rhetoric revolve around the effectiveness of language including its emotional impact (pathos), its logical content (logos), and its credibility (ethos). A basic premise for rhetoric is that how one says something conveys meaning as much as what one says. Think of the words used by the great writers, preachers, and statesmen throughout history to instruct, inspire, and influence. 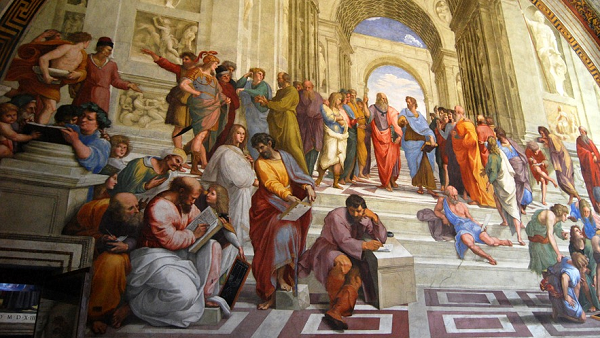 From Ancient Greece to the late 19th century, rhetoric was a central part of Western education. Since then, it would seem that the dumbing down of the school system has resulted in rhetoric virtually becoming a lost art. Nowadays, persuasive writing and argumentative speech is mostly limited to English papers, literary criticism, and debate classes. While in the public arena, impassioned speakers often resort to name-calling and insults rather than intelligent discourse. Training in rhetorical skills will set students apart with distinguished written and oral abilities, and may help us to regain some of the intellectual and spiritual high ground in a deteriorating culture. This 34-week course helps high school students develop the skills necessary to communicate more powerfully through writing and to articulate their thoughts clearly. Develop creative writing skills including descriptive writing, poetry, and short stories. Cultivate the use of expository writing including research papers, analytical essays, problem-solution writing, and firsthand accounts. Learn the art of public speaking, including persuasive speeches, informative speeches, debates, and more. This course includes basic grammar and writing composition, the writing of numerous academic essays, several public speaking presentations, and an extensive research paper. It counts for one credit of writing and one credit of speech. Comprehensive and reasonably priced, this course is a good choice for college-bound students. The author says it’s for junior high grades 7-9, but unless they’re really advanced, we’d recommend it for senior high grades 9-12 instead. The curriculum is suitable for use by individual homeschoolers, small homeschool co-ops, and private schools. This is a Christian-based course. Dr. Stobaugh weaves biblical concepts, readings, and applications throughout the curriculum. He wants this course to be not just an English class, but also a means to help equip students to stand firm in their faith and be prepared to actively participate in apologetics.